When I was growing up, the family dog wasn’t allowed in the house, and the cats wandered in and out at will. Now, our cats are strictly indoors, the dog sleeps on her bed at the foot of mine, and my son keeps a snake in his room. Over the past several decades, society’s attitudes have changed on the roles of pets in our lives, and we keep them in close proximity as part of the family. 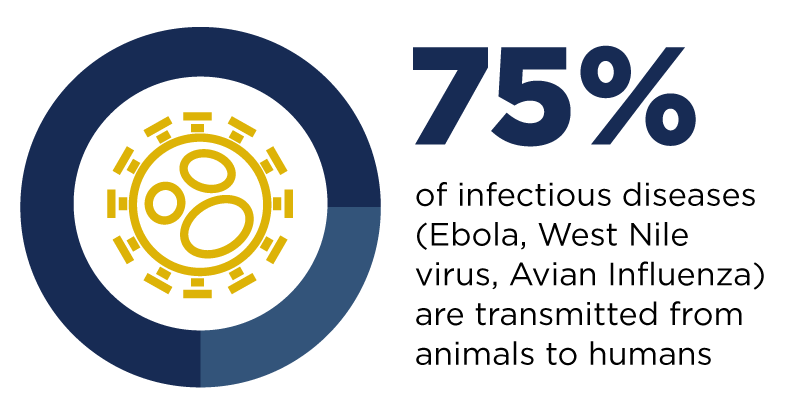 In fact, an estimated 60 percent of Americans have pets in the house, which also brings us in closer contact with zoonotic diseases. No, those aren’t diseases you catch at a zoo. Well, you could at a petting zoo, but the term “zoonotic” simply means that a particular illness can be shared between humans and animals. That said, it’s still wise to be aware of the most common infectious diseases you can catch from your pet. Dr. Sykes provides a short list and tips on how to protect the health of your pets and family. These are intestinal parasites often found in puppies and kittens. The eggs or larvae are passed through the animal’s feces. Hookworm can cause painful, itchy skin infections in humans. Roundworms may cause no symptoms in some people, but cause eye damage in others, especially young children that come into contact with pet feces. Have your kittens and puppies dewormed by the vet as soon as you bring one home. While gardening, don’t walk barefoot and do use gloves. Always wash hands after petting a dog or cat, especially young animals. Not actually a worm, this disease is caused by a fungal infection within the top layer of the skin. It’s highly contagious and can be passed among dogs, cats, horses, other animals and humans. You can also contract it from surfaces that an infected pet or person has touched, especially if you’ve been sweating a lot or have a minor skin abrasion. It causes a ring-shaped, itchy red rash that may be dry and scaly, or wet and crusty. Sykes says ringworm can be difficult to prevent but responds well to treatment. Avoid direct contact with infected animal or person until the ringworm is gone. Avoid contact between immunocompromised people and animals with skin problems until it is clear what is causing the skin problem. Wash sheets and pajamas of an infected family member daily. Seek immediate medical treatment from a veterinarian if your pet has skin lesions or consult a doctor for humans showing signs of infection. While infection is most often a result of eating contaminated food, pets can also spread salmonella through their feces. Reptiles such as lizards, snakes and turtles are likely sources of this infection, as well as chicks and ducklings. Dogs, cats, birds and horses may also carry it. Signs and symptoms may include stomach pain, diarrhea and fever. Always wash hands with soap and water after contact with animal feces or with reptiles and the surfaces they’ve touched. Avoid any contact with reptiles, chicks and ducklings if you have a weak immune system. You can get this bacterial infection from breathing in dried feces or respiratory tract fluids from infected birds, including parrots, parakeets, macaws and cockatiels. Pet birds don’t often show signs of this infection, which makes prevention more difficult. If you experience flu-like or respiratory symptoms after having a sick bird, see your doctor right away. Avoid purchasing or adopting a bird with signs of infection that includes eye or nasal discharge, diarrhea or low body weight. Change papers daily and regularly disinfect the bird’s cage in a well-ventilated area. Ask your veterinarian for a safe, effective disinfectant to use. If you suspect your bird may be sick, consult a veterinarian immediately. This is a bacteria transmitted through ticks. You can’t get Lyme directly from your dog, but if your dog or outdoor cat picks up a few ticks on their fur, they can pass them on to you. Symptoms can include: bull’s-eye rash at the site of tick attachment, fever, headache, muscle or joint pain. While Lyme does not manifest symptoms in all of those infected, without prompt treatment, it can become a chronic condition over time, causing nerve and heart inflammation, mental changes and pain. Cover your legs and arms when hiking in natural areas. Use veterinary-approved tick preventives on your pet and apply insect repellant with DEET on yourself when in areas with ticks. Remove ticks as soon as you can to help reduce chances of infection. Avoid tick-infested areas, especially in spring and summer, if possible.